It’s a typical school pickup discussion amongst the dads of Devonport. How to do-up, fix, and maintain the old wooden houses in the area. ‘Sounds like a business opportunity,’ I reply. The words lodge in my mind: factory rolling them out. 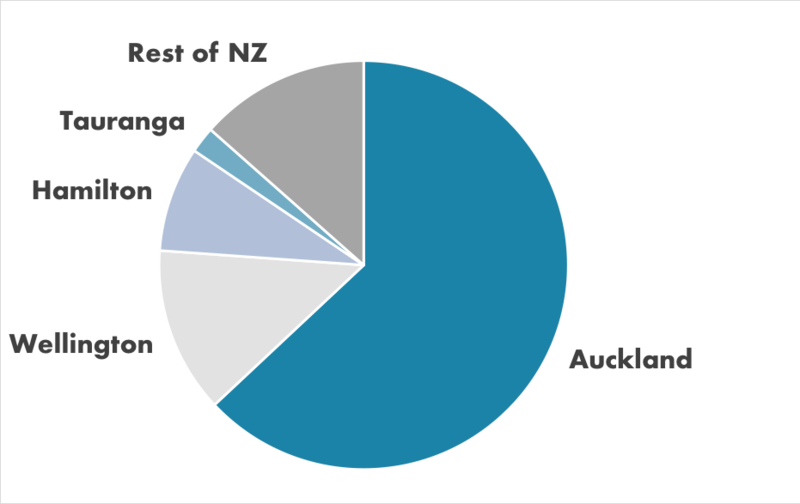 And when you think of factories rolling things out, you don’t think of New Zealand. Or Australia. Or America. Things get made in China. A friend of mine from South China used to live in a town that makes a good deal of the world’s lighting. His area supplies all the chain lighting stores in New Zealand. If you buy a lampshade or fitting, it’s most likely from this part of China. Yet when the lights go on in Auckland, there are too many overcompensated people selling ‘professional’ services. What real value does a lawyer, accountant, or ‘compliance professional’ add? They don’t produce useful light-fittings or any of those wooden fence caps you can see and use and touch. Ok, a good accountant can add value to your business – but more on the strategy front. And a good lawyer can fight for justice. And fortunately, in investment analysis — yes, another service — we do attempt to find the most productive areas to invest in. More importantly, we try to highlight trends in the economic world that can boost your wealth. Or destroy it. It’s been great for the developing world, specifically China, becoming the world’s factory. That’s lifted millions of people out of poverty. Celebrate that. Fully 70–80% of our GDP gets generated by selling services to one another. In the US, as far back as 2009, 79.6% of GDP came from the services sector. Fortunately, in Australasia, we have a significant commodities sector within lands of low population density. So we do sell some more real things to the world. Particularly milk powder (from NZ to China) and iron ore (from Australia to China). But service economies are the sign of a mature economy, right? Yes and no. The question is: where does it lead us? Let’s take a look. You know the story. When a factory owner anticipates better times around the corner, he ramps up output and puts people back to work. The warehouse fills up again. A service provider doesn’t do that and cannot do that. An accountant doesn’t hire more accountants until more clients walk in the door. And the service cannot be stored in a warehouse. Real wage growth is falling away. Because we’re competing to perform services (rather than producing more innovative products in factories), labour becomes more competitive. So people need to go and do advanced degrees in finance, law, and other complex service areas. Unlike an engineer or scientist who develops and improves products, these compliance-based service areas don’t add lasting labour value. In 2012, the Economic Policy Institute released the 12th edition of its survey, The State of Working America. It defines a good job as paying at least $18.50 per hour (the median hourly wage in 1979, adjusted for inflation) and offering health insurance and retirement benefits. In 1979, 37% of jobs held by men were good ones. Today, only 28% are. It has been a similar trend in other Western countries such as Australia and New Zealand. Real wages peaked in the late 1970s and have not reached this level in real terms since. Services become more complex and competitive. Then they get regulated. When someone performs a complex service, you then need a whole compliance industry around that service to ensure the service buyer is ‘protected’. You have more services like regulators and compliance consultants. This becomes a ‘necessary’ industry but produces little. Young people looking into the job market see that professional services — increasingly compliance focused — are well compensated. So they undertake long and expensive degrees, at great cost, to join the merry-go-round. None of this activity produces more of the products that improve material wellbeing anywhere in the world. And the laboratories and factories that would otherwise demand scientists and engineers increasingly move offshore. When you fail to sell your way in the world, there are two short-term measures to fill the gap and maintain the illusion of wealth. Western governments have found a solution to waning economic growth. Unleash cheap money into the economy through low interest rates and/or quantitative easing. And so we borrow to educate ourselves to perform complex services, buy overpriced homes and further prop up the illusion by consuming ultra-cheap goods made in factories offshore. Students take heavy mortgages on their brains in the form of student loans to fund degrees that will enable them to provide these high-priced services. But too often these loans will saddle them for decades, reducing the payoff of their original investment for years to come. Homeowners take ever higher mortgages to compete in overpriced housing markets. Check suburban employment maps. The problem is most acute in suburbs filled with ‘elite-service professionals’, where fat yet uncertain pay packets can cover silly mortgage multiples. Second — mass migration and offshore money. Migration by itself is a good thing. It brings in different cultures, skills, and opportunities. Celebrate that. But when you need rates of migration beyond which housing supply and infrastructure can cope with to flood in money to prop up an economy with a shortage of other options, that’s not a long-term solution. For many years, we even allowed foreign investment to go into an unproductive asset like our housing stock. So family home buyers in central Auckland found themselves up against Chinese factory owners at auctions. We’re now starting to see something closer to the true value of an Auckland home. Unsupported by foreign money. And facing a lower migration outlook. If the debt cycle comes home to roost and migration pulls down to OECD per capita averages, home prices in this town may have a longer way to fall. There are two reports sitting on my desk today. One signifies the problem. The other a solution. The first involves college graduates in the US selling their future. To pay for university, they allow investors to take a percentage of their future salary. It’s brain equity release, rather than brain mortgage. The investment is called an ‘income-sharing agreement’ or ISA. So when you graduate and earn $50,000 a year, the investor takes around $300 a month from your pay packet. For a decade or more. It’s yet another way to make money on the delivery of services in an economy with not enough else. You wonder when we’ll reach a point where so many service providers, subscription systems and credit providers shave your current and future income, there is little left. Many people are already there. He does, of course, mean tariffs. It’s a pity the man is such a divisive character. It’s simple business that an economy with high minimum wages and standards cannot compete with an economy with little or none. How can you make lamps or fence caps in New Zealand at $17.70 per hour with sick days, holiday pay, ACC and compliance — when they’re made offshore by workers paid USD $250 a month, working 12-hour days and sleeping on-site in cramped conditions? When someone is exploiting an unfair advantage, Trump is right to say we may need to handicap you. That’s a system used to ensure fair play in many areas of life. My last golf handicap was 28. My friend plays on a 5. We can compete fairly when adjusting for these handicaps. More important, I can concentrate on building my golf game — working on my areas of advantage — instead of giving up and becoming his caddy. The best thing I can do with my surplus is twofold. Invest in productive businesses that employ people in real jobs. Share the return from these businesses in dividends and growth. Then earnings from my services become a less important part of my income. There is one product-based area in the West that remains competitive for now. The global patent system and R&D investment required protects the development of the product line. There are several large pharma companies, headquartered in Europe and the US. One of my investments is shares in Sanofi S.A. [EPA:SAN]. It’s the world’s fifth-largest pharma company by prescription sales and the world’s largest producer of vaccines via its subsidiary Sanofi Pasteur. The midpoint share price reflects their key diabetes medicine coming off patent. Yet there remains upside. R&D is also focused on realising the promise of genomics, which could potentially lead to immuno-oncology transforming cancer treatments. Pharma investing can be risky. Medical research may not work out. Drugs may not get approved. For now, investing in real product that can materially improve life, makes sense to me. Celebrate sheds. Bring on the fence caps. Simon Angelo owns shares in Sanofi S.A. [EPA:SAN] via wealth manager Vistafolio.